Designed for people who aren’t necessarily familiar with cooking the type of food the bank gives out. Sep. 13, 2017 4:00 p.m.
With a new cook book and multiple fundraising events coming up, it’s safe to say the Sooke Food Bank Society has been keeping busy. The cook book was written by chef Pat Hogan and is being handed out free to clients at the food bank. It was designed for people who aren’t necessarily familiar with cooking the type of food the bank gives out, and also teaches clients how to stretch food out into more meals. Metzger said they believe that with a little bit of extra effort, such as teaching clients to garden or guiding them to housing subsidies, they can help move people past the food bank. “There’s nothing more exciting to us than when our past receivers become givers,” said Metzger. 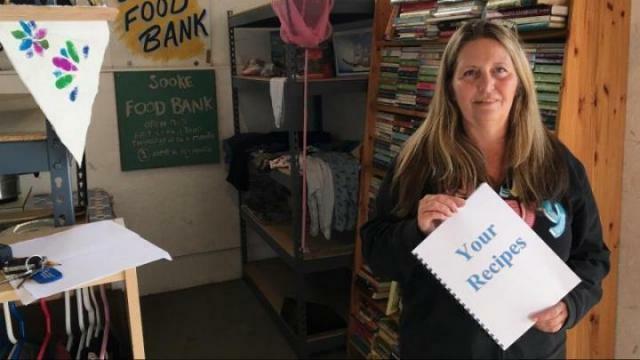 She added that the food bank tries to be kind and receive its clients with dignity.